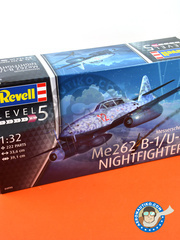 Scale model manufacturers, such as Aires, are usual suspects in the search of graphic material at air museums for developing their products such as the He 162 cockpit we bring you this week. 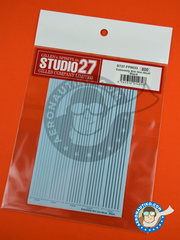 Museums, on behalf of Aeronautiko, thank you very much!! 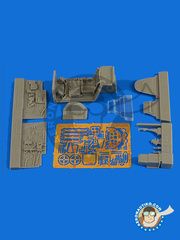 This set includes the cockpit and the wheel bay. 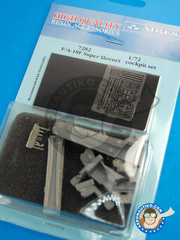 Photo-etched and resin parts for improving the cabin of Hasegawa's Hornet. 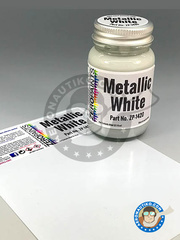 Metallic White tone paint with extra fine pigment, ready for airbrush use. 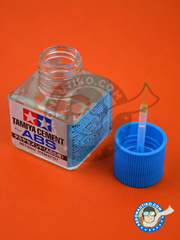 It is supplied in 60ml bottles. 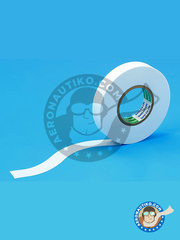 Tamiya took a big big step forward creating this 12 mm wide and 20 meters long masking tape, reaaaally helpful when executing straight lines and/or curves on your models. 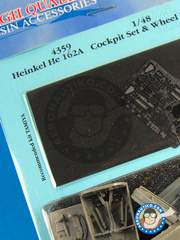 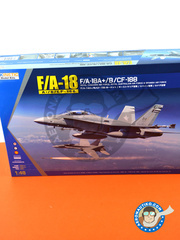 Enhacement set for Hobby Boss F/A-18 Hornet cockpit. 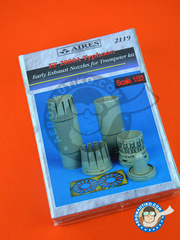 Aires brings the resin parts for replacing the incomplete and low detailed landing gear bays on Trumpeter McDonnell Douglas AV-8B. 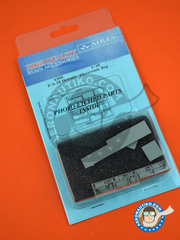 Specifically formulated adhesive for glueing together ABS parts, and also for glueing ABS and polystyrene parts. 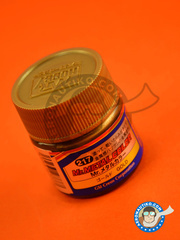 Includes 40ml and it's served in glass bottle with applicator brush. 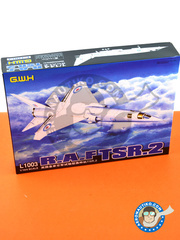 As usual, a fantastic scale model of the TSR-2 produced by GWH in 1/144 scale. 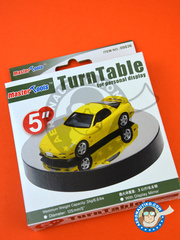 Simply delicious. 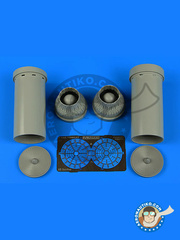 Set of resin and photo-etched parts with the Eurofighter Typhoon EF-2000 nozzles as operated in its early years. 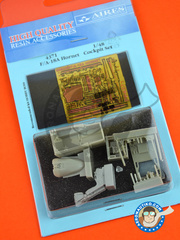 Set of resins and photoetched parts for improving the electronic bays on Hobby Boss McDonnell Douglas F/A-18 Hornet A scale model kit. 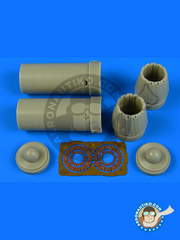 Set of closed position exhaust nozzles for the C version of the McDonnell Douglas F/A-18 Hornet by Kinetic in 1/48 scale. 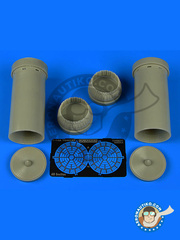 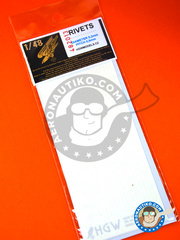 Set of open position exhaust nozzles for the Grumman F-14 Tomcat by Tamiya in 1/48 scale. 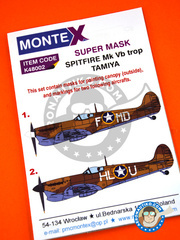 Masks por painting wings and fuselage markings and outside canopy. 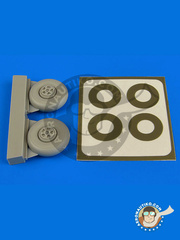 Aligned rivets decal, measuring 0.2mm diameter and 0.9mm spacing between rivets. 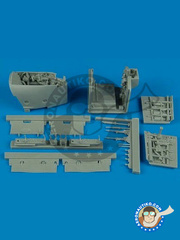 Resin and photo-etched parts for replacing the cabin interior of the Bf 109 G-6 by Eduard. 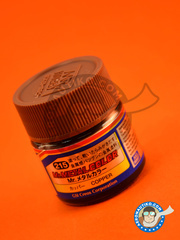 Mr Hobby's "Mr Metal Color" range paint for brush applications. 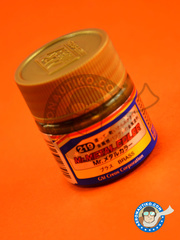 It is specifically formulated with exclusive metallic pigments.